Ask.com Hopes Ads Compute to Buzz from the Wall Street Journal reports that Ask.com is launching a new TV and web ad campaign today, to try to generate buzz about the Ask.com search engine. The article says this ad campaign is “gearing up to a relaunch of the site and the debut of its new search technology later this year,” which I assume is the Edison project. People slip the word into casual conversation with phrases such as “Do you have a lame algorithm?” or “I was all algorithm-ed out”…. 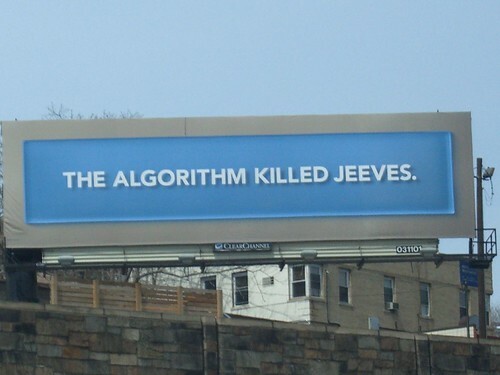 Ask.com has been generating some buzz already through the use of “algorithm” messages in billboards and posters. They also took part in this information revolution campaign that generated some buzz. Postscript: Ask.com just posted more details about the campaign. They have screen captures of some of the ads and commercials and they also explain the logic behind the campaign. Microsoft Prevents Ask.com from Running Ads on Facebook? from ClickZ reports that Microsoft allegedly does not want to allow Ask.com to run display ads through adCenter on Facebook.